Hindered by contract delays, bankruptcy proceedings, and switching ownership of the company that is building it, plans to launch Russia’s first floating nuclear power plant have again been scuttled, with the new launch date pushed back from this year to 2016, Bellona has learned. In all, Russia’s state nuclear corporation Rosatom wishes to produce six 70 megawatt floating nuclear power plants (FNPPs), which it says are designed to deliver power to far flung regions along its own northern Arctic coast, and says further that the plants are a hot item on the wish list of foreign customers, mainly China. Many of these potential foreign customers had been hoping Russia would meet its originally promised deadline for FNPP delivery of 2010. Environmental outcry over FNPPs has been present since their inception. Russia has neither the means nor infrastructure to ensure their safe operation, has made no plans for disposing of their spent nuclear fuel (SNF), and has not taken into consideration the enormous nuclear proliferation risks posed by placing nuclear reactors in remote areas. Furthermore, officials apparently have not considered their vulnerability to terrorist attacks while on site or during transportation to their intended locations. But the fates of shifting shipyards, bankruptcy of the shipyard to where the first floating nuclear power plant was transferred, and the acquisition of the foundering shipyard by other financial holdings have not been kind to the timely launch of one of Rosatom’s pet projects – and have more than once shed doubt on whether the environmentally dicey project would be completed at all. “With the constant changes of venue for construction, ownership and pushed back delivery dates, one begins to wonder whether this ill-advised project will ever see the light of day,” said Bellona’s general manager and nuclear physicist Nils Bøhmer. This first FNPP, the Akademik Lomonosov, is scheduled for deployment in Russia’s Far East Kamchatka region, which is prone to tsunamis and far for an ideal location for a nuclear power plant – especially moored at sea. The keel for, the Akademik Lomonosov, was initially laid in 2007 at the Sevmash shipyard in Russia’s far north and Far East. In 2008, Rosatom said that it would transfer its construction to Baltiysky Zavod because Sevmash was inundated with military contracts. The transfer did not take place without a whiff of scandal – not only was Sevmash overrun with military contracts, but a source from Sevmash told Bellona at the time that money the shipyard received that was earmarked for the FNPP’s construction was being siphoned off to fulfill the overflow military contracts. Initially scheduled for launch by Sevmash in 2010, this first launch date for the Akademik Lomonosov was scrapped pushed back to 2011. Later in 2008, Rosatom announced it was taking its business with the Akademik Lomonosov elsewhere and said the new construction venue would be the Baltiisky Zavod in St. Petersburg. Rosatom signed a contract for completion of the plant with Baltiisky Zavod in February 2009, projecting a completion date of 2012. But Baltiisky Zavod proved to be as rocky a harbor as Sevmash, and work on the Akademik Lomonosov was hindered as the St. Petersburg shipyard faced bankruptcy. In late July of 2011, Court of Arbitration of Saint Petersburg seized the newbuilding at Baltiisky Zavod after Rosenergoatom – Rosatom’s nuclear power plant operating wing that commissioned it – demanded recognition of its right of ownership to the unfinished vessel. 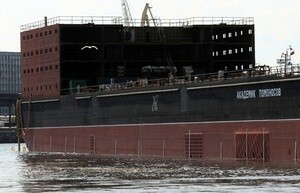 Rosatom was concerned the Akademik Lomonosov would be counted as one of the ailing shipyard’s assets when Baltiisky Zavod underwent bankruptcy proceedings. The court gave the go-ahead for the seizure on the basis of “significant risk” that Rosenergoatom could lose its investment in the 9.8 billion rubles ($340 million) vessel if another claimant seized Baltiisky Zavod’s assets during liquidation. It was a lucky move in a luckless history: Russia’s business daily Kommersant, citing the documents of the lawsuit, reported at the time that Baltiisky Zavod has in fact registered its right of ownership to the vessel. The largest shareholder in the Baltiisky Zavod shipyard, with an 88.3 percent stake, was United Industrial Corporation, which is owned by Sergei Pugachev, former governor of the Tuva Region. This stake had been pledged to Russia’s Central Bank as collateral for an unreturned loan to International Industrial Bank, another Pugachev-controlled company which was declared bankrupt in November 2010. Pugachev was also being pursued by a number of other vexed creditors include insurance firm Sogaz, which is demanding a 51.1 million rubles in missed premium payments for the insurance on the floating plant, Khanty-Mansiisky Bank, which is seeking 128.75 million rubles, and an unnamed local Gazprom subsidiary, which wants 36 million rubles, Interfax reported. United Shipbuilding Corporation to the rescue? Baltiysky Zavod finally went into receivership in January 2012 and Rosenergoatom was forced to cancel its contract with the shipyard. However, the shipbuilding company was acquired by state-owned United Shipbuilding Corporation in May and has since been relaunched as a new company. According to Rosenergoatom, over 90 percent of the work has been completed on the hull of the Akademik Lomonosov, World Nuclear News reported. The turbo-generators have already been installed, while the two 35 MW KLT-40S nuclear reactors – similar to those used in Russia’s nuclear-powered ice breakers – have been assembled and delivered to the shipyard ready for installation. The first batch of fuel for the floating plant has also already been produced, said WNN. A spokesman at Baltiisky Zavod reached by Bellona Friday said he was not authorized to comment on why the FNPP’s launch would be delayed another four years.